A contestant on The Bachelorette is under fire yet again for views expressed on social media, and while ABC is apparently looking into it, the situation this time is rather tricky. Just after 29 year-old Garrett Yrigoyen was shown receiving the first impression rose from new Bachelorette Becca Kufrin during Monday's premiere, screenshots surfaced that showed what appeared to be his Instagram account "liking" some offensive posts, including some disparaging women and the transgender community and accusing Parkland shooting survivor David Hogg of being an actor. Last season of The Bachelorette, contestant Lee Garrett was found to have posted a bunch of racist and otherwise extremely offensive tweets, comparing the NAACP to the KKK, for example. A couple of days after the tweets were exposed, Chris Harrison tweeted, saying "For those asking, no, of course we didn't know about the offensive tweets from Lee's account. None of us were aware of them[.] Very unfortunate." While Lee was not a frontrunner and would likely not get very far with the franchise's first black lead with gross views like that, the controversy still showed ABC that they needed to be a lot more diligent about their contestants and their social media activity. "We've made a really really big effort to make sure things like that don't happen, and we start scrubbing social media accounts," ABC Senior VP Robert Mills told Entertainment Tonight, but even that "really really big effort" couldn't keep up with the fans who knew you could easily check on a social media user's liked posts. "In the case of the Garrett thing, first of all…it's an alleged account, and it's likes, it's not things he's actually posted, which are things you actually can't scrub unless the person has a certain number of followers," Mills says. The current controversy is rather different from the one surrounding Lee Garrett. No actual offensive posts by Garrett Yrigoyen were found, only offensive posts he had allegedly "liked" on Instagram, and he's not trying to win the heart of the franchise's first black lead. He's also the current season frontrunner, based simply on the fact that The Bachelorette has a history of first impression rose winners doing extremely well. Kaitlyn Bristowe, JoJo Fletcher, and Rachel Lindsay all ended up engaged to the guy they gave their first roses to, and all three couples are still together. Andi Dorfman gave hers to Nick Viall, who at least made it to her final two. So if history is any indication, Garrett most likely makes it pretty far into Becca's season, and if he's one of the guys she ends up having a real relationship with, this isn't just a matter of ABC or anyone involved with the show making a statement condemning the posts he liked. It's a lot more complicated than that, even if only because they can't spoil their own season to let us know how far he gets, and therefore how much this matters. Becca herself, who has commented on the controversy both to E! News and other outlets, can't say much, because how she feels about this whole situation depends on a lot of factors (not to mention her own social and political views). If Garrett doesn't make it far, it doesn't really matter either way. But if she's now engaged to him, it's a whole different ball game, and a whole conversation that couple now has to have on their own. Either way, "spoiling" the end of the season is a big no no, even when spoilers are readily available online. Becca probably ended up saying all that she could really say. "Everyone is entitled to their own opinions, and at the end of the day, I wanted to go on this journey to open up myself and have people see my love story unfold and I would hope that they would stay open and respect me but also stay open and respect these 28 guys that went along on the journey with me," she told us. She also told ET that if the allegations were true about any guy she dated, "We would have a discussion about it. We would get to the bottom of it and we would find a solution." Mills' interview made it clear that while ABC is concerned about the situation, it also really is a complicated issue for them. "It's starting to be looked into, and addressed, but I don't think anything has been definitive yet," he explains when asked if he knows for sure that the account really belonged to Garrett. "It's kind of hard to do anything now when the show has been shot, but I think that we will certainly look into how we would address this on the show once we get all the facts." Lee's offensive tweets were addressed on Men Tell All, so that's probably where the show would address this situation as well, if they address it. In any case, we'll probably have to wait until later in the season for anyone to say anything substantial. One thing that Mills mentioned multiple times was the desire to "scrub" social media accounts, rather than just combing through to make sure there were no offensive posts in the first place, even explaining that "likes" are "things you actually can't scrub unless the person has a certain number of followers." He went on to say that ABC wants only the best for its Bachelors and Bachelorettes. "Obviously we want to know every single possible thing about these contestants. So we're working harder," he says. "I mean, it is such a new frontier, social media, and I think it's important for us to really be on top of this stuff, and certainly, we never want a situation like what happened last year with Lee to ever happen again. We are here telling everybody we are putting the best men and women forward for the lead to date, so I think we want to make sure we are absolutely doing that." If the show really wants the best men and women, should "scrubbing" really be the best strategy when it comes to social media? Why not look for people who have nothing to scrub? Sure, this problem would have probably never existed if ABC had been able to "scrub" all the posts Garrett's alleged Instagram account had ever liked, but that doesn't change the fact that the person who liked those posts also likes those views. Social media is a huge part of dating in 2018 and a huge part of the Bachelor franchise, but it's still not allowed to be a part of dating during filming on the Bachelor franchise. 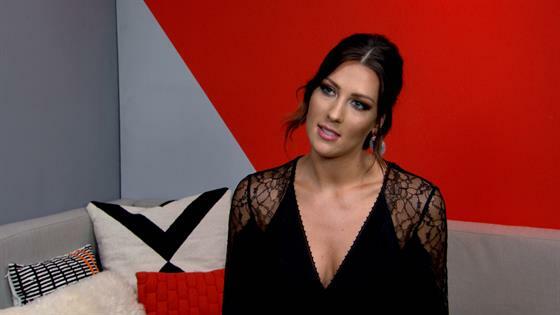 Contestants aren't allowed to have their phones or computers or any access to the internet during production, meaning Becca likely came out of this engaged to a guy whose Twitter or Instagram account she had never seen. In an ideal world, that might be nice—and according to Becca, she's living in that world. "It's different, but it's nice in a way, because I was truly getting to know these guys for them, and hav[ing] conversations face to face with them about things that were important to me," she told us, going on to explain that she felt she got a "better picture" of who these guys were than if she had looked at their social media accounts. But the fact remains that in 2018, social media is how the majority of us communicate and express ourselves. It's gotten to the point where it's part of who we are, or at the very least it's the way we've chosen to present ourselves to as many people as possible, and it's probably pretty alarming to come out of a two month bubble of a relationship with someone you might have just promised to marry only to discover that the person they are publicly online is not the person you expected or thought you knew. Becca has likely spent the last couple of weeks since filming ended getting to know the more public persona of her fiancé for the first time while the entire world (or at least all of Bachelor nation) has been doing the same thing, diving deep into Twitter and Instagram as soon as we had full names to look up. Collectively, this fanbase knows far more about each contestant than Becca could have ever learned over the course of a couple months. If we're really rooting for the relationships from this franchise to be successful, that's pretty unfair, and makes it fairly inevitable for situations like this one to happen. So maybe if ABC is really serious about social media diligence, the show needs to come out of its bubble, embrace the world we're living in, and give its stars all the possible information they need to make good decisions about the people they could potentially want to spend the rest of their lives with—or at least the person they could potentially want to associate themselves with on Instagram. Update, 4:30 p.m.: Yrigoyen has issued an apology on a new Instagram account, saying "I never realized the power behind a mindless double tap on Instagram and how it bears so much weight on people's lives. I did not mean any harm by any of it. My Instagram "likes" were not a true reflection of me and my morals." You can read his full apology in the post above.